The proper management of reagents and supplies in the laboratory is often a challenging task. However, creating and adopting systems for purchasing and inventory control can enable cost savings in addition to ensuring supplies and reagents are available when needed. The procedures that govern the management of purchasing and inventory should be designed to confirm all reagents and supplies are of good quality, and that they are used and stored in a manner that preserves their integrity and reliability. At Mayo Medical Laboratories, part of Mayo Clinic’s Department of Laboratory Medicine and Pathology located in Rochester, Minnesota, we support 58 laboratories that perform testing with consultative care from Mayo Clinic physicians. To maintain these operations, the cost of supplies and materials consumes approximately 20% of the overall laboratory budget. Thus, the quality, availability, and management of these products can have a significant impact on lab efficiency and productivity. To address this, our laboratories utilize a mature, just-in-time inventory system where data and supplies flow in concert with each other to optimize inventory levels. Because lab efficiency and productivity are compromised when supplies unexpectedly run out or expire, it is critical to strike the right balance between maintaining the lowest necessary inventory levels and avoiding stock outages. This can be best accomplished through the evaluation of historical data on supplier lead times, testing demand, and validation times. At Mayo Clinic, historical data is largely accumulated through our automated point-of-use inventory system and is made available for analysis by laboratory personnel. There are numerous strategies, tools, and resources (both human-based and automation-based) that can assist in the proper management of laboratory supplies. For one, Lean strategies can play a pivotal role in controlling and maintaining supply expenses. Mayo has implemented the 5S methodology—Sort, Set in order, Shine, Standardize, and Sustain—in its laboratories, which is the basic foundation of any Lean system. This methodology helps manage physical inventories accurately and efficiently while promoting the creation of a smooth flow of material and information up and down the supply chain. To facilitate this, we have been assertive in working with our vendors to help create and sustain this flow, which in turn adds value to the supply chain. Working with vendors on process improvement projects related to supply management typically results in improved efficiency for both the vendor as well as the lab. When considering this process, two successful examples come to mind. The first involved a specific laboratory where we made changes to more closely tie the lab’s order quantities to demand for their allergen reagents. By doing so, we were able to improve the flow of product from the vendor’s distribution center and resulted in fewer back orders. The second example involved the use of a Kanban process (using the rate of demand to control the rate of production or acquisition) in a laboratory to smooth demand of their media. We worked closely with the vendor to allow them to better forecast our needs and improve product outdating. From a technology-based aspect, Mayo laboratories’ use of an automated point-of-use inventory system is the primary approach to inventory management. In addition to automating the ordering process, this inventory management system provides valuable data with which to manage and improve operations. The data is used to generate a set of key performance indicators that move beyond simply tracking supply expense to understanding contract compliance, inventory turnover rates by laboratory, and inventory system utilization. The results from the key performance indicators are collected and made available in a monthly supply chain inventory dashboard. Monthly supply costs per test, supply costs as a percentage of revenue, inventory turns, inventory quantity on hand value, percentage of dollars on contract, inventory utilization, inventory compliance, and reconciliation by laboratory are all measured against targets to ultimately improve efficiencies and contain costs. Every product managed within our automated point-of-use inventory system has its own unique attributes that dictate the size and the timing of reorders. Examples of these unique attributes include expiration dates, relative storage space, validation times, manufacturing lead times, and even length of delivery lead times. Due to the fact that the ordering process is almost entirely automated, there is a significant reliance on laboratory staff to establish proper inventory levels, which in turn impact inventory turnover rates, inventory quantity on hand value, and reconciliation and system compliance scores. These metrics are provided in our monthly Supply Chain Inventory Dashboard and are reviewed monthly with all laboratories in order to address significant deviations compared to established targets in a timely manner and to help avoid waste and excessive overhead. Poor inventory management can lead to multiple types of waste including excess inventory, backorders, expired products, and the generation of a significant amount of manual effort to keep supplies on the shelf. Effective inventory processes should help minimize all these forms of waste and should support good laboratory practice guidelines and standard operating procedures. For example, by removing extra steps from the process used to validate a new lot of reagent received in a laboratory, we were able to reduce inventory levels as well as decrease the amount of manual labor needed. Automated processes across all supply chain support teams are critical to ensure the accuracy and efficiency of product ordering, receiving, and payment. From the onset of an order, we utilize an electronic data interchange (EDI) method of transferring that order information to the appropriate vendor. The use of EDI is commonly used in supply chains for large facilities to eliminate the need for human intervention and thereby remove human error factors from the process. EDI also enables transparent order tracking; upon receipt of the order from the vendor, the electronic document is retrieved and compared to the actual product shipped. 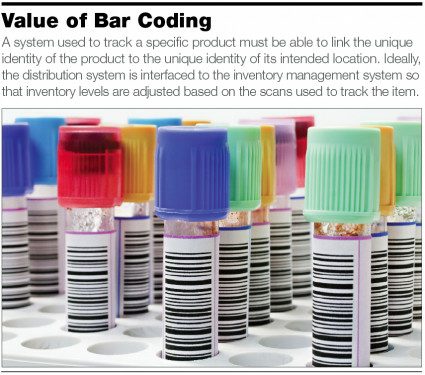 Positive confirmation of the shipment is made and the distribution handlers then use bar code scanning to ensure delivery to the appropriate laboratory location. Finally, once invoiced for the product order, the vendor’s pricing is validated for all products against a vendor price file. Should there be discrepancies, alert messages are received by one of our supply chain price administration coordinators and resolved directly with the vendor. When looking for a distribution system to manage the movement of supplies after receipt, a key consideration is how to track the movement of the received goods to the point-of-use area. The system used to track a specific product must be able to link the unique identity of the product to the unique identity of its intended location. Ideally, the distribution system is interfaced to the inventory management system so that inventory levels are adjusted based on the scans used to track the item. Thus, the ability to interface systems is key to improved operations. If a hospital or heath system has multiple facility sites, distribution between facilities should be accomplished in much the same way with tracking technology used to associate unique identifiers. For example, the system should associate the product to a known location specific to each site (dock, skid, tote, truck, etc) through a positive contact scan. Another important consideration is the ability of the tracking technology to associate purchase orders with vendor tracking numbers or advanced shipment notices (ASNs) to allow for self-service by the end user. Self-service in a tracking scenario allows end-users to access real-time information on product location without utilizing a customer service entity throughout the continuum. Reducing human intervention is often vital to reducing the cost per unit delivered. We have found that the most effective way to manage inventory in the laboratory is to make sure all lab personnel have some degree of responsibility related to inventory management, even if it is simply dispensing a product or triggering a reorder. Since every lab staff member is affected by inventory, they all need to recognize that they play a role in making the processes work. With that said, key individuals should be identified for specialized tasks, such as placing new product orders and overall system maintenance. This specialization helps improve consistency in supply ordering and also frees up lab technicians to focus on testing operations. At a minimum, individuals managing supplies need to have access to the information necessary to place orders, such as vendor names and contacts, and order quantities. An even better scenario is if they have access to data to help identify areas for process improvement. For example, a report that shows inventory turnover rates could be used to highlight products that need refreshed inventory levels. Likewise, the incorporation of perpetual inventory systems, which may be manual, card-oriented, or computer-based, are intended to trigger orders when supplies fall below a predetermined reorder level. Within the Mayo Clinic laboratories, our automated point-of-use inventory system tallies up supply usage and automatically transmits an order to the vendor when supply falls below the predetermined level, which allows us to avoid most stock outages. As with any area, it is important for management to thoroughly evaluate the need for every position in the work setting. In the case of staffing to oversee inventory, a lab must justify the benefit of the position, so it is critical for the lab management team to evaluate the potential cost savings related to a well-managed inventory system (eg, less waste, less excess inventory, etc). While most hospital laboratories do not need a significant number of staff devoted to inventory management, maintaining FTEs sufficient to the volume of testing and level of inventory purchasing and management is critical to a lab’s overall operational success. As with all requisition and management programs, the relative sophistication of inventory and supply procurement and tracking systems depends largely on what can be supported to administration. Therefore, presenting compelling data to support process improvement projects is essential. This data should include references to projected inventory cost savings, reduced space needs due to stocking only needed inventory, and maintaining appropriate supply levels to support all lab operations. Furthermore, these savings will translate into the amount of FTEs needed to effectively manage laboratory inventory. If possible, further data, such as inventory turns, month-to-date and year-to-date supply expenses, and lab testing volumes will also help clarify and legitimize requests to administration. We find it critical to furnish our lab staff with easy-to-use tools so that their analysis can be completed properly and also to recognize continued accomplishments and successes.